In my last article, I briefly mentioned that the Cubs give up the lowest BABIP against on balls hit with less than a 10° launch angle, these being ground balls. I attributed this partly to having Addison Russell playing shortstop. Today, we'll see if we can glean anything from Statcast to substantiate this claim. That's right, we're going to pore over some more data from baseballsavant. Lucky, we are. Let's start off by looking at all batted balls that Addison Russell has a reasonable chance of getting a glove on. Hmm... where to start? We better at least filter out everything hit outside of Cook County to be safe. Actually, this should be pretty easy. Baseballsavant lets you filter by batted ball direction (or horizontal launch angle). 0° would be directly over second base. 45° would be directly over first base. And -45° would be directly over third base. Let's use 0° and, oh, -25° as our parameters. (I've played around with the horizontal launch angles some, and -25° is pretty far in the hole, but there are a lot of plays made there by shortstops. Anything further and we start getting in a mix of third basemen, too.) Let's also set the maximum vertical launch angle at 10° to remove all the fly balls that travel well over his head into the outfield. And finally we'll make the minimum batted ball distance at 70 feet. This should take away any plays made by pitchers or bunts to the left side of the infield. Alright, the parameters are set. We're going to be looking at practically any batted ball that is hit in the general vicinity of a shortstop. There are going to be some plays that will skew things a little -- any batted ball into a shift, for one. Also, Addison Russell hasn't played shortstop in every single inning of the season, and we are going to filter by team. This isn't a perfect measure of anything. But, this ought to give us a reasonable idea of what's going on. First, here's the league average BABIP (batting average on batted balls) on all such batted balls under these parameters: .312. If you are a major league baseball player and you hit a ball in that direction, without getting the ball airborne, you can expect to reach safely 31.2% of the time. How do the Cubs (Addison Russell) fare against the rest of the league? First. By a wide margin. The Cubs BABIP against on these balls is .200. The next lowest in the league is .233. Addison Russell destroys all batters' hopes and dreams. The difference between Addison Russell's BABIP allowed on these balls and the league-average BABIP is larger than the difference between Dexter Fowler's and Tim Federowicz's batting averages. Shut it down. There's nothing left for me to write about. Actually, I want to keep going. There's more good stuff to come. Let's change things up a little and see if maybe there is something funky going on with that data. Maybe the launch angle is messing us up. I'm going to take the launch angle parameter off, and instead filter everything classified as a "ground ball" hit in this area of the field. This will take away any liners, and these are plays shortstops do have to make sometimes. And "ground ball" is a little subjective. (When exactly does it become a ground ball, if the infielder doesn't catch it?) It doesn't matter... still first. 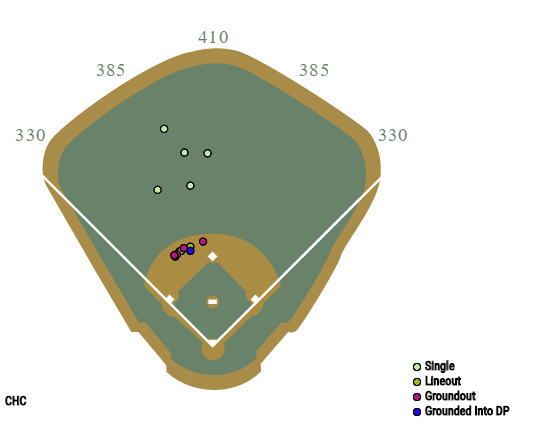 The Cubs' BABIP on ground balls in this area is .177. The next lowest is .206. OK. So Addison Russell knows how to get guys out when they hit the ball near him. Can he make any tough plays, though? Let's investigate. We all know Addison Russell has impressive range. Unfortunately, we don't really have anything at baseballsavant that we can use to measure his range -- at least not that I know about. But, there is something we can look into. I wrote a lot about exit velocity in my last article. Let's get back into that. Balls that are hit really hard are difficult to field. But, if it is a hard-hit ball driven straight into the ground that bounces several times, those aren't exactly tough plays. It might be a little more difficult if you have to range over to get it. But it's still a pretty routine play for a big league shortstop. The difficult ones are the hot shots right by you. The low liners. The balls that come screaming at you 100 mph. Ones that you might have to play on a short hop, or snag out of the air. The ones you don't have much time on. The balls you have to react to right off of the bat. Let's look at all balls hit at least 100 mph and at a vertical launch angle between 0° and 9°. These are either going to be low liners or balls that will bounce right before getting to an infielder. These are the batted balls that often eat up a fielder. The league average BABIP on these balls is .601. Let's also go back to the horizontal launch angle of between 0° and -25°. And we'll also set the minimum distance at 70 feet to again remove balls hit at pitchers. And we'll put the minimum velocity at 100 mph. So these are hard, low liners in the general vicinity of shortstops. The league average BABIP on these balls is .618. Where do the Cubs rank among all MLB teams? Did you really have to ask? First. The Cubs give up a BABIP of .357 on these balls, and the next-lowest team is at .524. Now, these are hard, low liners. It's probably going to be tough to get them if they are deep in the hole. And we don't have enough information, such as fielder positioning, to make any reasonable assumptions about this data. But, we can narrow the parameters down some. Let's try between -2° and -23°. Still first. You can move those limits around a few degrees in either direction, and it doesn't really affect things too much. Addison Russell has double-plus hands. He can really flash the leather. His reaction time is impeccable. On balls that might eat up a lesser shortstop, Addison has no issues. He has no trouble gobbling these balls up and quickly turning a double play. Tricky hops will not deter him. Does this data really mean anything? No, probably not. These are small samples and there is a lot of noise in there, like defensive positioning. But, if you look at the teams at the top of the list on BABIP on these hard liners at shortstops -- the Cubs, Reds, et al. -- these are teams with shortstops that generally rate very well in the advanced defensive metrics. Down at the bottom you have the Rays and Brad Miller, the Yankees and Didi Gregorius. These teams' shortstops generally rate extremely poorly by defensive metrics. We could look at last year, too. The top two are the Indians and the Giants. Francisco Lindor and Brandon Crawford... yep, it checks out. The Cubs ranked 26th last year in BABIP on these hard-hit, low liners near the shortstop. From the start of the season until August 7th, the Cubs ranked 29th. From August 7th on, the Cubs ranked 7th. I shouldn't have to tell you what happened on August 7th. I think we're in synchronicity here. I'll leave you with this. The following are spray charts for these batted balls that are hit at least 100 mph and at a vertical launch angle between 0° and 9°, with a horizontal launch angle between -25° and 0°. One is for the Yankees and their stone-handed shortstop, Didi Gregorius. The other is for the Cubbies, with our double-plus handed shortstop.